Everyone has heard about the infamous double chin, and while people may assume that a double chin only happens as a result of age or being overweight, this isn’t usually the case. However, a double chin often makes people feel heavier or older than they actually are. So, it’s not surprising that people come into our office looking for a way to get rid of their double chin. That’s when the professionals at Affiliated Dermatologists serving Morristown, Mt. Arlington, Liberty Corner and Bridgewater, NJ, recommend Kybella®. Kybella® is an FDA-approved injectable that is used to treat adults over the age of 18 that have excess fat under their chin. This injectable contains deoxycholic acid, a molecule that is naturally found in the body that helps to breakdown dietary fat. When Kybella® is injected into the chin, it destroys fat cells to prevent them from storing more fat. When you come in for treatment, the first step we will take is to create the proper treatment plan, which will include information such as how many treatment sessions you will need in order to achieve the results you want. Many patients are able to see results around two to four sessions, but some patients may need up to six treatments in order to get the results they want. During each session, we will inject multiple needles into the chin to target and eliminate these stubborn fat cells. Another perk to Kybella® treatment is that once the fat cells are destroyed and you have obtained the aesthetic results you’ve been looking for you will not require additional Kybella® treatments in order to maintain your new results. Imagine going through life after your treatment with a shapelier and more contoured face that is free of a double chin. Kybella® has been helping thousands of patients worldwide eliminate excess fat under their chin and it could also help you. If you want to find out if Kybella® is right for you then it’s time to called Affiliated Dermatologists serving Morristown, Mt. Arlington, Liberty Corner and Bridgewater, NJ at (973) 267-0300 to schedule your no-risk consultation. Kybella® is a series of injections into the fat beneath your chin to improve the appearance and profile of moderate to sever fat below the chin also called, "double chin". 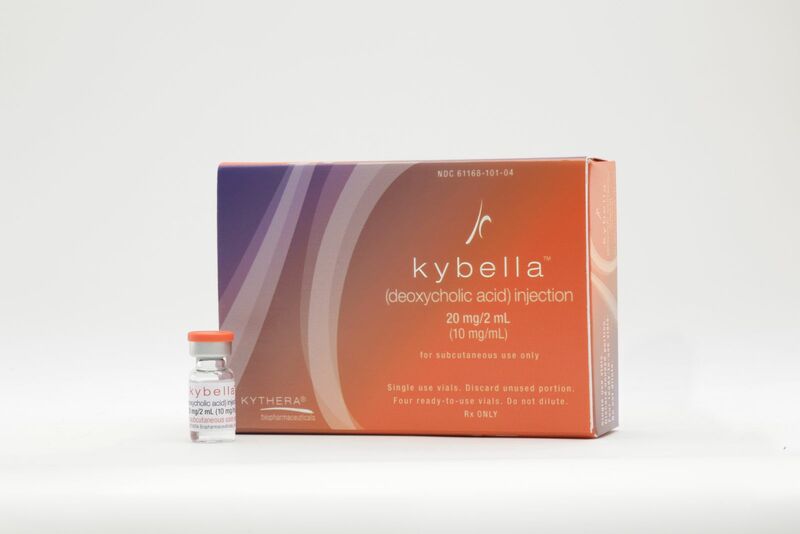 Kybella® is deoxycholic acid, a naturally-occuring molecule in the body that aids in the breakdown and absorption of dietary fat. When injected into the fat beneath your chin, Kybella® causes the destruction of fat cells. Once destroyed, these cells can no longer store or accumulate fat. How many treatment are needed? You and your doctor will decide how many treatments you need. For more information about Kybella® and to schedule your appointment, call Affiliated Dermatologists at 973-267-0300!